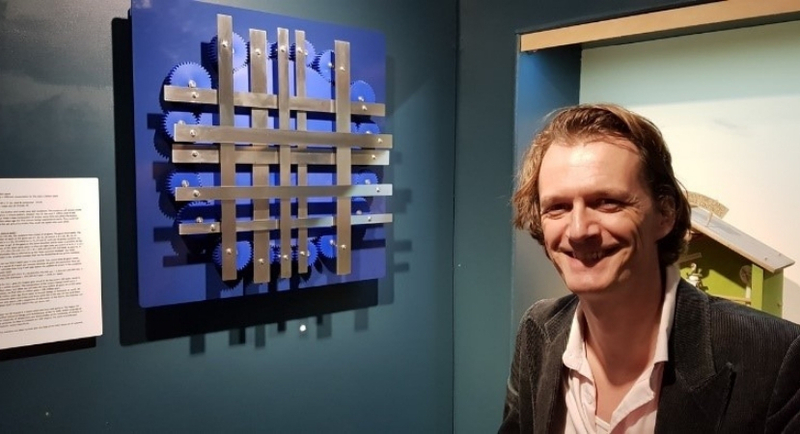 The Dutch artist Lukas van de Vrande brought a piece of art he made to the MAD Museum in Stratford upon Avon. His machine ‘Two Million Years’ is a combination of art & science. Stipes move up and down, back and forth, and when the machine stops after 20 seconds, the composition of the stripes will always be different. Always? Yes. Well, at least for the next two million years. The machine plus the protecting box was a bit heavy, so Lukas decided not to go by plane. Because he is Dutch and is not used to drive on the left side of the street, he chose to come all the way by train. Luckily his father accompanied him to fulfill the job, as getting in and out the train and subways in London isn’t that easy with a big box. The machine will be in Stratford for the next couple of months. To find out more about the machine and see it working, visit the MAD museum or see www.LukasArt.nl.